Sauropod dinosaur osteoderms from the Late Cretaceous of Madagascar. 2011. K. Curry Rogers, et al. Nature Communications 2, article number:564. Abstract: Osteoderms are bones embedded within the dermis, and are common to select members of most major tetrapod lineages. The largest known animals that bear osteoderms are members of Titanosauria, a diverse clade of sauropod dinosaurs. Here we report on two titanosaur osteoderms recovered from the Upper Cretaceous Maevarano Formation of Madagascar. Each osteoderm was discovered in association with a partial skeleton representing a distinct ontogenetic stage of the titanosaur Rapetosaurus krausei. Combined, these specimens provide novel insights into the arrangement and function of titanosaur osteoderms. Taphonomic data confirm that Rapetosaurus developed only limited numbers of osteoderms in its integument. The adult-sized osteoderm is the most massive integumentary skeletal element yet discovered, with an estimated volume of 9.63 litres. Uniquely, this specimen possesses an internal cavity equivalent to more than half its total volume. 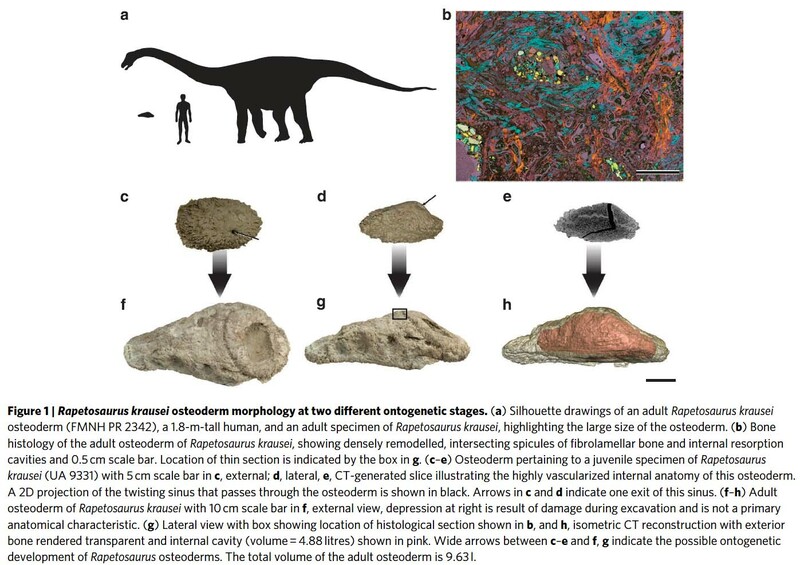 Large, hollow osteoderms may have functioned as mineral stores in fecund, rapidly growing titanosaurs inhabiting stressed environments.